The second Rhondda Rocks event was another great success. Photos from this amazing event are now available. 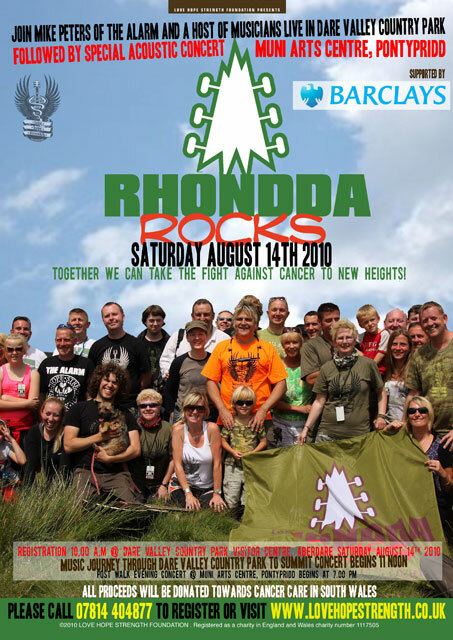 On Saturday August 14th 2010, Mike Peters, was joined in Dare Valley Country Park for ‘Rhondda Rocks II’. The day was overcast, but that walk was a great success and Mike stopped at various point in the walk to sing, and was joined by local boy Chris Summerill. 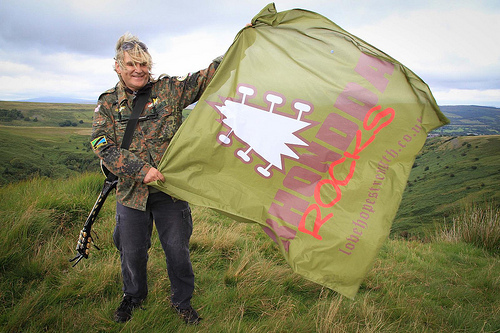 “All proceeds from ‘Rhondda Rocks II’ will go directly to Cancer Care in South Wales”, says Mike Peters. “Last year’s event was very successful and I hope that in time, ‘Rhondda Rocks’ will become as huge a success as ‘Snowdon Rocks’ has been for North Wales”. Rhondda Rocks has this year attracted the support of Barclays Bank who are getting behind the event by offering financial support and encouraging staff and customers from within the banking community to get involved and climb in support of the cancer care initiatives that are being proffered by Love Hope Strength Foundation, they also had a team of walkers with us on the day.